I can't remember who gave me the recipe, but I had to re write it,, I add coconut milk or cream of coconut to the batter, as it's a pretty thick batter, and it adds some extra coconut flavor. 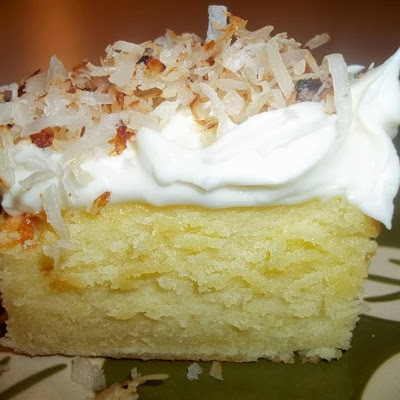 I like the dense texture of this cake together with the creaminess of the cream cheese frosting, and the crunchiness of the toasted coconut. Prepare a 9 x 13 pan with non stick cooking spray. Cream together butter, cream cheese and sugar. Beat in eggs one at a time, vanilla and then mix in flour. Bake 35 to 40 minutes or until wooden pick comes out clean. Beat together butter, cheese, vanilla and add sugar. You can now toast coconut. I toast mine in a lighty sprayed skillet and keep tossing until golden. You can also place coconut on a baking sheet and toast in oven, turning frequently so not to burn.